Like many local government organisations in the UK, the City of Wolverhampton Council is committed to protecting and improving the services it delivers to its 250,000+ residents, despite unprecedented financial, economic and socio-economic challenges. The Council was recently honoured at the MJ Awards, and named the Local Authority of the Year 2017. In order to reach its goals to improve the economic health of the region, the Council set to create £1.5m worth of operational efficiencies within three years, with a mission to better connect its customers to its 30 services. As customers get accustomed to fast, efficient service, the Council’s high desks, glass walls and multitude of friction points were causing unnecessary aggravation among visitors. With up to 10,000 customers visiting in a single month, the Council’s old space was becoming problematic when it came to quickly and easily finding the right floor, reception or person. Ultimately, the Council needed to transform and re-think the existing customer journey, by focusing on consolidation of services, removing physical barriers and creating a clear and easy to use environment. The Council wanted to replace it with a bright, welcoming and personalised service, supported by aesthetic changes such as new uniforms. It was also important that the transformation process was underpinned by a channel shift strategy, to help the Council move more services online (negating the need to visit the building) as per the Government’s Digital Service Standard. This would also enable better measurement of performance, enabling the Council to make near real-time improvements to service delivery and create cost savings. 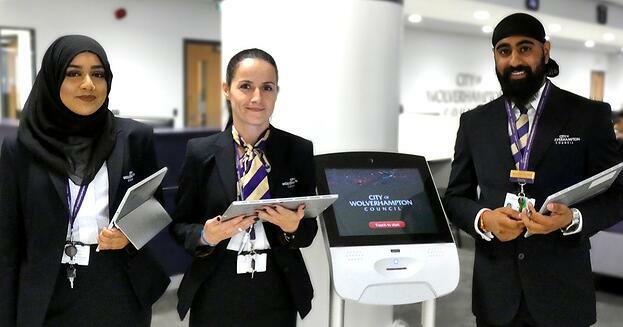 Qmatic was selected to work with the City of Wolverhampton Council throughout the three-year programme. With a physical re-development of the space underway, Qmatic provided the Council with a complete technology solution to support both customers and staff from online to the minute they entered the building. Qmatic implemented several internet-connected kiosks for a dedicated self-service area, as well as tablets for front of house staff, and multiple digital displays and media screens to keep customers informed of their place in the queue. The entire system runs on the Qmatic Orchestra enterprise software platform, including appointment management capabilities. Orchestra is a robust customer journey management solution with modular flexibility, enabling the Council to add appointment management for pre-booking and on the day service requests via the self-service kiosks and mobile staff tablets with ease. Qmatic Orchestra enables the Council to better understand their customers’ journeys, from appointment to service delivery, and delivers actionable journey insights from real-time data and fully customisable historical reporting. It also ensures that resources are centrally managed, including digital display information and workforce administration via skills based routing, to ensure the right staff are available to serve at the right time. Tablets enable front of house staff to help customers arrive either for a pre-booked appointment or as a walk-in to get into a virtual queue for service. Walk-ins receive paper tickets with their unique references, with all the information about their waiting time clearly displayed on the big screens, and automatic voice announcements that let them know when it is their turn. Since going live, the changes to the Council’s building have made strides towards realising the organisation’s goals throughout the project. Paul continued: “Working alongside Qmatic we were able to completely assess the customer journey and where key changes should be made to create efficiencies. The team’s expertise and experience working with local government is impressive, and they involved all levels of staff in the implementation process to give input and ownership of the solution. The Council also benefits from vital insights into the channels that customers are using, enabling managers to see what services and processes can be moved online to save resource and cost in the future. Real-time data provides historic and current operations and feedback to Qmatic Orchestra users, including measurable KPIs for staff performance reviews. We would love to talk to you and find out more about your challenges so we can see how we can help create great customer experiences. Qmatic is the global leader in customer journey management technology solutions and insight. We help organizations to integrate online and onsite engagements. The result is experiences that improve business, support employees, and delight customers, patients and citizens. We are committed to Connecting People to Services! For questions and support let us hear from you.